How exactly do referrals work? I am giving a two-hour free referral bonus to any client who refers another paying client. What do you think of that idea? What marketing tools have you found the most effective? I am on unemployment which is not enough to make ends meet, and I have had to get things for my business by raiding my grocery money (maxed out credit). I am trying to get a micro-business loan, but have not done so yet. Are online directories and search engines the way to go? How did you find your industries small prospects for sales calls? Do we have to worry about “Do Not Call” lists if someone uses one phone number for everything? How much “cold calling” did you do to get started? About your website screening intake form: I could not find your business website, nor could I find anything in the store about an intake form. Is there another resource or should I just pull together my own and tweak it through experience? If a client asks for a particularly dicey project that I am not sure I can handle, how do I address that without looking incompetent, undersupplied technologically, or setting myself up to fail? 1. How do referrals work and what about giving a referral bonus? A referral is when someone (could be a client, could be a colleague, could be a business associate… anyone) refers/recommends/tells someone about your business. What do I personally think about paying people to refer you? I don’t advise it. Let referrals come organically through the good will and high esteem you generate from doing good work. Those recommendations and referrals will carry far greater weight because of it. Plus, keeping track of referrals and rewards just creates another needless task and complication in your administration that you don’t need. Dear Danielle: How Do I Advertise for Referral Partners? 2. What marketing methods are most effective? Are online directories and search engines the way to go? It doesn’t hurt to be in directories, but you don’t need them. And SEO is the least effective way your most ideal, qualified client prospects will find you. It’s not the thing to waste your time focusing on right now at this stage of your start up. Your best leads will always come from your own incoming marketing pipelines. And how do you do that? In our business (as it is with most professional service-based businesses), networking is hands-down the most effective marketing strategy. Not ads. Not cold-calling. Not direct mail. The great thing about networking is that it doesn’t cost anything but your time. And that’s not a cost, it’s an investment because those efforts will ultimately pay with new clients and prospects. The reason networking is so effective is because people look to work with those with whom they have established some kind of relationship and feel some kind of rapport. Every opportunity you have that lets a group of people get to know, like and trust you is going to make it that much easier for you to attract clients. Of course, the key to networking successfully starts with a target market. Otherwise, you’ll wear yourself out networking anywhere willy nilly. Be sure you download the free ACA guide on How to Choose Your Target Market, which elaborates a bit more on what a target market is and how it will make growing your business and getting clients much faster and easier. 3. What cold calling did you do to get started and how did you find prospects for sales calls? None. I didn’t look for any. I never did cold calling and I don’t advise you do either. People don’t like to be sold to; it’s completely the wrong strategy. Professional services are a bigger ticket item and requires more relationship building and nurturing than that. Sure, you might hear some people say they got this client or that project all from a sales call. But those are the exceptions, not the rule. I can just about guarantee you don’t have the kind of money and energy to ever make cold calling a worthwhile ROI. Even if you get one project, it isn’t going to come close to covering all the time, energy and effort you put into getting it. And think about it. Do you really think you can keep putting in that kind of work just to get one or two nickel-and-dime projects? You need bigger money and bigger clients to stay in business and be profitable. There are MUCH better, faster, more effective strategies for getting clients, one of which is deciding on a target market to focus on and then getting involved with that industry in every way you can (online forums, business groups, events, etc.). The more you interact, the more they get to know, like and trust you. 4. Is there a resource for an online intake/consultation request form? If I’m understanding your question, I think you are referring to an online form you have clients fill out to request a consultation. Having a form like this on your website will help screen and prequalify prospects. By asking a few simple questions, this form can help you determine what stage of readiness a potential client is at, whether or not they are in your target market, and whether they can afford your services. Depending on the questions you ask and how they fill out your online consultation form (which has the dual underlying purpose of helping prequalify clients), this can tell you what level of priority or attention to give a potential client or whether to guide them to further information on your website to learn more before moving on in the process. For example, if someone is only “browsing,” you may not want to waste your limited time and effort on a consultation. You may instead want to send them to a white paper you have prepared for these kind of instances, and invite them to subscribe to your blog or ezine. Many clients are not ready to work with us immediately so it’s all a process. Here is a blog post that talks more about how the consult form can act a prequalifier: One Way to Sort the Ideal form the Unideal. As far as a resource, I recommend you get my Client Consultation guide. Not only does it give you usuable examples of an online intake/consultation form and questions you may want to ask, it will walk you through the entire consultation process from start to finish: from targeting clients, identifying your ideal client profile, prequalifying clients, how to conduct the actual consultation conversation and what questions to ask, how to follow-up afterward and what the next steps are once you take on a new client. It’s VERY thorough! 5. How do I handle a request for something I don’t know how to do (or do well)? First, you have to distinguish what kind of business you are in. Are you in the secretarial business where you’re simply doing one-off, transactional, piecemeal project work? Or are you in the business of administrative support? Because the two are completely different business models. Once you answer that question, it will help answer subsequent questions about what kind of client needs that work, what work is entailed and so forth. When you know what you do and who you do it for, and educate clients accordingly, this kind of thing isn’t as much of an issue. However, let’s say you are in the administrative support business and the client asks if you do X thing. Honesty is always best so tell them if it isn’t something you know how to do or that you have limited experience/knowledge with it. That said, you can always let them know that you are willing to learn how to do it (IF you are interested in doing so, that is). Or, you might look at this project or work and think to yourself: You know, this really doesn’t fall under administrative support at all and isn’t what I’m in business to do. They really need to be working with someone who is in the X business. In that case, you might offer to help them locate the proper professional who IS in business to do that thing. Or, in yet another example, perhaps you have a separate division in your company that does this thing, in which case you would take them through those separate processes for intaking that kind of work or project and charge them separately for it. Just because a client asks doesn’t mean you’re supposed to comply. They need educating. If you were a plumber and someone asked you to fix their car, that wouldn’t make any sense, right? And you’d inform them very simply and helpfully that what they need is an auto mechanic, not a plumber. YOU have to decide what administrative support consists of in your business and what doesn’t. When you have that clarity yourself, you shouldn’t have any qualms about letting clients know when something doesn’t fall under the umbrella of your support. Always be clear and upfront with clients about what’s what in your business. You’re not going to look bad in any way for not taking on or knowing how to do something or needing to refer them to another kind of professional entirely when that’s the case. The only time you will look bad and create ill will is by not being honest and straightforward. 1 Comment Posted in Best Biz Practices, Consulting with Clients, Dear Danielle, Marketing, Referral Based Marketing, SEO, Starting Your Biz, Target Market, What Services Do You Provide?. Bookmark the permalink. This was a question someone asked me on my Facebook page. They didn’t give me any more details than this and I never did hear back from them. However, I thought it was an interesting topic for discussion and wanted to share my thoughts with you here. At first blush, it sounds like a very one-sided relationship if you have clients who don’t refer you. But it’s a little too glib to chalk it all up to that. There’s usually more to things than that and you could be losing out on an opportunity to improve your business by not examining the issue further. Unless you’ve actually spoken with a client, you can’t presume to know their true feelings, intentions or what’s really going on (if anything). Having a heart-to-heart can clear the air to move forward in a more positive, mutually beneficial direction. It could be that they just didn’t think about it and it wasn’t anything negative about you (or them) at all. Now, personally, I don’t like to hound clients for referrals. I prefer they give those of their own accord. And in a healthy, two-way relationship, they will. That said, a lot of the referrals I’ve gotten over the years just weren’t who I was looking for anyway so they did me no good. My best leads have always comes from my own networking. If clients want to make a referral, I ask that they simply direct people to my website (instead of my phone number or email) so that it can do that critical first job of educating prospects and weeding out/prequalifying those I’m not interested in. By getting them to the website, I save myself a lot of wasted time in conversation with people who may not be a fit. Plus, directing folks to my website first, those who are interested in what they’re reading and what I have to offer, I’ve just created an opportunity to get them onto my mailing list so I’m only keeping in touch with those who’ve already indicated that first qualifying level of interest. Those who follow up from there, thus, are vastly better qualified leads and more likely to become clients. You have to actually INFORM clients that you welcome referrals and instruct them how to refer others to you and what kind of prospects/clients you are looking for. This is why it’s also extremely helpful to have a target market and to be very clear about what you do and who you’re looking to work with. When people know exactly what you are and who you do it for (e.g., NOT a gopher/jack of all trades, but an Administrative Support Specialist), it’s much easier for them to refer others to you and they will remember and be more likely to do so more often. I would also ask, have you at least gotten a testimonial from your clients? Instituting a regular and consistent program of feedback from clients in your business is super helpful for your marketing and constant business improvement. I have a tool in the ACA Success Store that helps you do this and collects information from clients so that testimonials basically write themselves. You can take a look at that here: Client Feedback Form. I refer to it as a form, but it’s really a plan and system for implementing a program of regular feedback in your business and capturing testimonials and before-and-after case studies. So, is this something happening in your business as well? Have you fallen prey to “secret weapon” syndrome and you find some clients don’t want to let anyone know about you because they don’t want to share you with others? Or might their silence and lack of referrals be an indication of other underlying problems? Are they unhappy or resentful about something? How is this affecting your relationship with them, and how does it fit in with your standards for your business and around who makes an ideal client? 2 Comments Posted in Best Biz Practices, Best Communication Policies, Clients, Dear Danielle, Referral Based Marketing, Relationships. Bookmark the permalink. I think that’s a terrific idea to spotlight your referral partners in your blog and ezine! Because if you’re going to be referral partners with someone, it’s the “partner-y” thing to do to actively promote them in the same way you’d like them to promote you. So often we see folks becoming referral partners and it becomes a one-way street with one person doing all the referring and the other person not making an equal effort. That’s not cool, and if that’s the case, they don’t deserve to be referral partners with you. What they fail to understand is that one of the best ways to get referrals is to give them. For those who don’t know what we’re talking about, a referral partner is someone in the same or similar business or a complementary field that you refer business to and vice versa. It could be because your practice is full. It could be the client just isn’t your cup of tea, but might be perfect for that other person. It might be that the client is seeking a service that you don’t offer. Or it might be because you like to be a resource to your current clients whenever they seek services that aren’t related to what you’re in business to do. 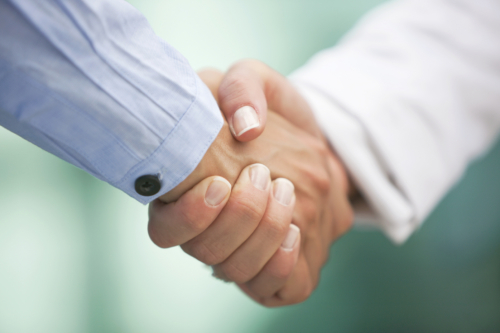 Printshops offer a good example of the complementary referral relationship. They always know of several designers and photographers they can refer their customers to. They’re all in different kinds of businesses, but their work is related and share the same or similar markets. So they complement each other in that way. It makes perfect sense to refer to each other, and being a resource who can refer others and make qualified recommendations is huge help to their clients and customers. Now while I think it’s absolutely wonderful to promote your referral partners whenever you have the chance, I do have a few thoughts about the rest of your question. First, I don’t know that I would necessarily advertise for referral partners. That is, if I advertised for referral partners, do I really want to receive what might be tons of emails to wade through and create for myself the extra work and burden of basically interviewing people? And second, how substantive and authentic would it be for me to refer to folks I really don’t know much about or have actual experience with? I would prefer to find and nurture those relationships more organically, and selectively choose or approach potential referral partners based on the fact that I’ve developed a relationship and gotten to know them to some good extent over a period of time. I don’t want to just have people I can refer to. I want to refer to people whose talents, work and reputation I have absolute confidence in and will be a good reflection on the recommendations I give. A disingenuous, unsubstantive referral is not helpful to anyone. I want my word to mean something. One last thought, while you are helping give back to your referral buddies, think about also devoting a separate space or blurb about what makes an ideal client referral for you. Those who are reading your blog and ezine might not be ready to work with you, but they might know of someone who is. So make it super clear who you are specifically looking to work with and want referred to you (i.e., your target market and ideal client). The more clear and specific you are, the easier you make it for people to refer to you and the more often they will do so. Originally posted September 29, 2010. 2 Comments Posted in Dear Danielle, Marketing, Referral Based Marketing, Relationships. Bookmark the permalink. Dear Danielle: How Do I Get More Qualified Referrals? Excellent question, Kim. And I totally feel ya! The first thing I want to assure you of is NO! You never need to settle or take on any client who is not a fit. This is YOUR business and YOUR life. You are not obligated to take on any client just because someone, client or not, refers them to you. And I’m positive your client would never assume or expect that. It’s just a friendly referral made out of what is obviously a great relationship and happiness with your service. I’m going to go one step further and have you look at this from another angle as well. Consider the idea that it’s actually your moral and ethical duty to ONLY work with those people who are a fit in terms of both the work and the personal chemistry. Why? Because you can’t truly help and give your 100% best to those you just don’t gibe with. And that’s not fair to them or you or even your other clients (because your unhappy/nonideal relationships with poor-fitting clients affects them in all kinds of ways as well, both directly and indirectly). What’s needed moving forward is more clarity and education of your friends, associates and clients about the kind of potential clients you want them to refer to you. And how do you do that? Have a target market. This is yet another instance where having a very specific target market helps you in business. People need a mental coathook to remember things with. The more specific you are about who you want referred to you (e.g., “I work with solo attorneys who work in intellectual property and entertainment law who need administrative support.”), the easier you make it for people to send you referrals and the more referrals you’ll get. Be clear about what you are and what you do. Same idea here. If it isn’t clear to those making referrals what you are (“I’m an Administrative Consultant”) and what you do (“I provide administrative support to solo/boutique attorneys who work in intellectual property and entertainment law”), they a) won’t make any referrals at all, or b) they’ll refer any ol’ body for any ol’ thing because they only have the vaguest understanding. You want to avoid generality. Funnel EVERYTHING through your website. All your marketing and networking, all your signature lines, all your print collateral… direct everything to your website. Clarify your message and educational content on your site to make #1 and #2 absolutely, positively clear. Your website can then do the front-end/initial work of screening and prequalifying prospects for you. Incorporate a consultation call to action step on your site that asks some screening/prequalifying questions such as in an online form they have to submit in order to schedule a consultation. For example, you could have a box for them to enter in the profession/industry/field they are in. Or you could ask them a question that reiterates what you do and asks them to confirm that this is what they are seeking. For example, “I provide ongoing administrative support to solo attorneys on a monthly retained basis. Is this what you are seeking?” Those kind of clarifying questions help them get clear about what you do, who you do it for and whether that’s what they are interested in learning more about before you ever waste time in a consultation. Add a referral page on your website that explains and reiterates/summarizes what you do, who you do it for, who you are looking to be referred and who is your ideal client as well as who benefits most from working with you. This page is then available to your site visitors, and you can direct clients and others to this page as well when they ask about sending you referrals. You could also create an online (PDF) and/or print referral kit. This doesn’t need to be anything super fancy. The last thing anyone else wants is more paper and “stuff” to manage and keep track of in their life. So keep it simple. Your referral “kit” could consist of a single one-sheet that summaries what you do, who you do it for, the kind of clients you’d like referred to you, who your ideal client is and the kind of client who benefits most from working with you. Add a link to your PDF referral kit to the Referral page on your site. And make your PDF print-ready for those occasions when you do need something to hand out to folks in person. These steps will help ensure that future referrals are more of a qualified fit for you and your business (and you’ll get more of them because you’ve made it easier and more understandable for people who and how to refer to you). The other recommendation I have is for you to get my client consultations-that-convert guide, Breaking the Ice (GDE-03). I’ve included an entire section in this guide dedicated to foll0w-up and tells you, step-by-step, exactly how to handle and what to do with prospects who are not a fit in a very gracious, friendly and helpful way. They won’t feel insulted at all. In fact, they will most likely go on to refer others to you! 1 Comment Posted in Clients, Dear Danielle, Getting Clients, Referral Based Marketing, Target Market. Bookmark the permalink. Dear Danielle: How Do I Get Clients? 1. Stop donating hours. When you give away your value (the very product you are in business to earn your living from), you devalue it in the eyes of clients. Worse, all giving stuff away for free does is attract freebie-seekers. These are not your clients. They will be gone as soon as you take the free buffet away. If they can’t afford professional services, they either shouldn’t be in business, or they should at least not expect you to subsidize their business (to your own detriment) until they can. These are very selfish, self-centered thinking people. You have your own bills to pay and people to take care of. You can’t put your time and energy into those folks. You’ve got to market to people who can already afford you and who don’t expect you to be footing the bill for their business. If you keep giving it away for free, you’re just going to keep getting more of the same. “Why pay for the cow when you can get the milk for free?” applies here. If you’re dishing it out, they’re gonna take it. You are attracting what you are giving. So stop the gravy train and get serious about serious clients. 2. I’m not sure why you think this, but this is not strictly a referral-based business. A business can become mostly referral-based once they’ve established their business, had a chance to get their foot in the networking door, and have clients and others who happily recommend them. If you’re new, you don’t have that right off the bat. But there are things you can do and ways you can network that will better draw/attract prospective clients to you. What will help here is having a target market to focus your message on and give you direction on where to find those folks you wish to be talking with and expend your efforts and energy there (which are limited and need to be conserved for the highest and best possible use). Two of the most important criteria in deciding on a target market are that 1) it must be one where the people in it generally are earning enough money that they can afford professional services, and 2) there are enough of them that it’s easy enough to figure out where they are (offline and off) and then find ways to interact with them, come up in their search terms and be found by them. 3. Never, ever bargain with or negotiate your fee. All you are doing is teaching clients to devalue you and your support. You start doing that and they forever after expect freebies and discounts and that everything is up for negotiation. You don’t even have to tell me what you’re charging. I can pretty much guarantee that you are undercharging–all these issues you describe are always symptomatic of rates that are way too low. They cater to and attract the wrong crowd. On top of that, I’m willing to bet the conversation on your site is all about cost and discounts and freebies and savings and how much cheaper and more affordable than an employee you are, yada yada yada… am I right? That’s exactly the problem. I would tell you to raise your fee. You likely will be ALL kinds of uncomfortable doing that. And while you’re doing that, you also will need to learn how to market differently and change your message. But when you do those things, you will begin to attract a clientele with an entirely different mindset and more professional business sense. Those folks are looking for skill and quality and competence, not handouts. You simply can’t waste your time and energy–and money, because that’s what it boils down to–on folks who can’t afford you and would have you harm yourself financially in order to help them. 4. Adding onto the idea of changing your message, you’ve got to frame what you have to offer in respectful ways. You’ve got to hold what you do in high esteem and talk about it in respectful terms. If you use words like “generalist” and “mundane” and “affordable” and the like, you are lowering the perceived value of what you have to offer. You are teaching prospects to look down upon your work and view it as lowly, and thus, not worthy of professional fees. And the industry as a whole has GOT to get off the cost conversation and all the employee comparisons. If you have any of that stuff on your site, take it off immediately. You are creating and attracting the very mindsets you are complaining about now. If everything you put on your website is about how cheap you are, how much they can save, how much more affordable you are than employees, save this, get a discount on that, guess what you are focusing people on? MONEY. You can’t make your marketing message about that–unless you want to continue to attract nothing but people who are looking for savings and discounts and bargains and cheap and affordable. Stop talking about costs whatsoever. That’s the last thing you should be talking about. And if you don’t have anything else to talk about with regard to what you do for your clients and your value to them (the results you help them achieve), then you’ve got a lot more work to do about understanding what you are and what you do. Marketing and attracting clients is an area of ongoing learning and study. It’s not anything that can be answered quickly or simply in a mere blogpost, but I hope this at least gets your wheels turning. The very best way I can help you is to recommend that you get my e-book, “Articulating Your Value: How to Craft Your Own Unique Marketing Message to Get More Clients, Make More Money and Stand Apart from the Crowd.” This is a self-study guide that will help you determine your target market, define an ideal client profile, differentiate yourself with your own unique marketing message and value proposition and package up that info in much more attractive, marketable ways. 13 Comments Posted in Administrative Consultants, Bad Clients, Best Biz Practices, Best Communication Policies, Clients, Dear Danielle, Financial Success, Getting Paid, Ideal Clients, Marketing, Positioning, Referral Based Marketing, Starting Your Biz, Target Market, Value Is Not About Money. Bookmark the permalink. Dear Danielle: How Do Referrals Work? Referrals come from lots of different places and come in many different forms. Sometimes colleagues will refer clients to you. According to our annual surveys, the overwhelming majority of people follow the “what goes around, comes around” philosophy and don’t charge for referrals. Others do charge referral fees or will want a percentage of any earnings from a client for a certain time period. You’ll want to get clear with the referring colleague as to what their expectations or requirements are. You can also formally ask clients for referrals. For example, you could make it a standard question as part of your feedback process to ask clients for the names of folks they think would benefit from your support. Your networking becomes a sort of referral source as well in that it helps you develop your word-of-mouth recognition. As you contribute and people read your posts, you become someone they come to know, like and trust. This leads to folks referring and recommending you to others. You might have some sort of formal referral program that rewards people for referring prospects to you. Although personally, I really don’t recommend this for a professional service practice. There’s really no need and keep in mind, you would just be adding yet another burden to you administrative managements workload. Keep things simple is what I always say. Anything that unnecessarily increases or complicates work in your business makes it that much less profitable. Those who genuinely know your work and feel it’s worth recommending to other will do so of their own accord. Your evangelists aren’t looking to be paid. They simply believe in what you do and they want to be a resource for their own audience. Those who do end up giving great referrals to you, you can thank by sending referrals their way as well and maybe once in awhile sending a little gift. As you become established with a happy roster of clients, they tend naturally to refer you to others when they get a chance. This is another form of word-of-mouth advertising that leads to referrals. But I would definitely recommend being proactive as well in specifically asking clients periodically for the names of folks they think could use or would be interested in your services. Another thing I would recommend you get conscious about is your calls-to-action. In your signature lines and in your “About the Author” text (such as when you publish articles you’ve written), include a line that says something about welcoming referrals. This puts the conscious thought in people’s head and tells them that you are actively seeking clients. What do you think? Leave a comment! Posted in Dear Danielle, Getting Clients, Referral Based Marketing. Bookmark the permalink. See updated post here: Dear Danielle: How Do I Advertise for Referral Partners? What do you think? Leave a comment! Posted in Dear Danielle, Marketing, Referral Based Marketing. Bookmark the permalink. I think that’s a terrific idea–to spotlight your referral partners in your blog and ezine. Because if you’re going to be referral partners with someone, it’s the “partner-y” thing to do to actively promote them in the same way you hope they are doing for you. So often we see folks becoming referral “partners” and it becomes a one-way street with one person doing all the referring and the other person not making an equal effort. That’s not cool, and if that’s the case, they don’t deserve to be referral partners with you. What they fail to understand is that one of the best ways to get referrals is to give them. For those who don’t know what we’re talking about, a referral partner is someone in the same or similar business or complementary field that you refer business to. Your practice might be full. A client who isn’t your cup of tea, might be perfect for that other person. A client is seeking a service you aren’t in business to provide (e.g., you in the administrative support business and they need a marketing consultant or web designer). You like to be a resource to your current clients whenever they seek services that aren’t related to what you are in business to do. Print shops offer a good example of the complementary referral relationship. They always know of several designers and photographers they can refer their customers to. Each of these is a different business and profession, but the work is related and they all serve the same sort of market. So they complement each other in that way. It makes perfect sense for them to refer to each other, and being a resource who can refer others and make qualified recommendations is a HUGE help to clients and customers. And second, how substantive and authentic would it be for me to refer those I really don’t know much about or have actual experience with? I would prefer to find and nurture those relationships more organically, and selectively choose or approach potential referral partners based on the fact that I’ve developed a relationship and/or gotten to know them to some good extent over a period of time. I don’t want to just have people I can refer to. I want to refer to people whose talents, work and reputation I have confidence in and will be a good reflection on the recommendations I give. I want my word to mean something. A disingenuous, unsubstantive referral is not helpful. Those who are reading your blog and ezine might not be ready to work with you, but they might know of someone who is. So make it really clear about who you are specifically looking to work with (your target market—which is the industry/field/profession you cater your administrative support to—and ideal client), and you’ll get many more referrals because you’d made it easy for them to remember and send people your way. One of the ways you will get new clients in your business is through simple word-of-mouth. What’s wonderful about referral-based business is that when you are referred by a happy client or business associate, they are giving you an automatic seal of approval. People trust the recommendations of their friends and business associates. You can’t buy better advertising than that! 3. Solicit feedback from clients on a regular basis. Always ask clients for their feedback at the end of every project. Don’t be afraid to hear anything negative. You can’t grow unless you know exactly where your blindspots are. If you work with retained clients, get their feedback every six months to see how you are doing. 4. Include testimonials on your site. Besides clients actively referring to you, you can also use their testimonials to refer business to yourself. Ask happy clients for testimonials. If they’ve provided a glowing review on a feedback form, ask if you can use it in your marketing. 5. Provide full client profiles. Testimonials have more meaning when the visitor sees they are from real people. Provide the full name and business of the client with a link to their website. Better yet, include a photo. 6. When you make it clear, you make it easy. You notice I mention “ideal referral profile” up in #1 and 2. Here’s what that means: You can’t work for anyone and everyone, and you can’t be in business to do anything and everything. The more narrow and specific you are about who your target market is and how you help them, the easier you make it for others to refer to you. And they’ll do so more often. 7. Buddy up. Become referral partners with several other colleagues, vendors and professionals. That way, when you each have clients you can’t work with or work you can’t or don’t do in your business, you can refer to those people and vice versa. 8. Join forces. Sort of like co-branded advertising and marketing, you get referrals at the same time someone is referring you. 9. Say thank you. It really is important! People like to be acknowledged for their help and they like to keep helping those who remember their manners. Make it job #1 to let the person who referred that recent new client know how much you appreciate them. 10. A quick word about paid referral programs: don’t. When it comes to professional services, my advice is don’t pay for referrals. Not with money, not with free time, not with free services. You don’t need to and it really casts the referral in a less than authentic light and makes it suspect. You don’t want prospective clients to think the only reason someone is referring you to them is because they’re getting paid in some way. On top of that, you just create more administration in your business and work and accounting you have to keep track of. It’s an unnecessary headache you don’t need. People like to help. They like to help their friends, clients and colleagues. They love it when they can be a resource and font of information. Help them be a resource to others by providing them with fabulous service and work and giving them the tools to spread the word about you—and they will! RESOURCE: What are clients really thinking about your work and service? How well are you meeting their needs and expectations? The Client Feedback Form gives you the tool to really find out with a combination of quantifiable measurements and free-form responses. The client sentiment information this tool collects is like gold and will help you create before and after case studies and turn feedback into testimonials while capturing referrals at the same time. What do you think? Leave a comment! Posted in Getting Clients, Marketing, Referral Based Marketing. Bookmark the permalink. There are all kinds of clients in this world, more than plenty to go around. As an industry, we have only begun to scratch the surface of all the people and industries/fields/professions we can be helping, and will be helping eventually. There are also way more good people — and clients — in the world than there are rotten eggs. I clarify that lest anyone who hasn’t yet developed their world sense about this industry be discouraged by my vent yesterday. There is still all kinds of potential and opportunity and wonderfulness out there for you and everyone. The biggest problem we face as an industry is not bad eggs, it’s learning how to market ourselves, in the right way, with the right focus, to the right people. Our poor marketing, both individually and by the industry at-large, is part of the reason we are attracting so many of these bad eggs in the first place. Fortunuately, that’s a problem that can be easily solved with the right marketing training and education. In fact, I wrote the most straight-forward, step-by-step system to do just that. When I get my vent on, I say what I say for the colleagues who don’t feel they can say it themselves. I keep it real and say what many wish they could, and would say, if they felt it wouldn’t hurt their business. Sometimes, you just gotta tell it like it is, get it out in the open and out of your system, without all the maudlin woo-woo crap and without stuffing your feelings and apologizing for being a human being. I say what I say, the way I say it, because I’m in a position to do so. However, I wouldn’t ever advise you to follow suit. There is no place for ranting about clients in your dialogue (your blog, your networking, etc.) as you build your business. These rants are a conversation between me and you (and me to those particular clients) and our own industry. It’s not a conversation you should be having with your clients or prospects or anywhere within earshot of them. All that will do is alienate good clients along with the bad. It’s a turn-off; they won’t know the difference and will think you’ll be difficult to work with. As I’ve advised more than one of my members on several occasions: Unless you are an industry leader, have already built your practice and aren’t looking for clients, don’t be an evangelist for the industry. That’s not your job. Your job is to be an evangelist for your business, your target market and your would-be ideal clients. That said, there really are two essential groups of clients. There are clients who get it, often easily, sometimes with just a tad more education and focusing them on the right things, and who do value our support and can afford some level of it or another, as well as prospective clients who get it, want it, honor it, but might not yet be in a position to have it for whatever reason. These are people who deserve your every graciousness, regardless of whether you end up working together now or later or ever. If you’ve purchased any of my administrative support business success store products and learning guides, you know that I’ve long advocated that people in our industry always focus and place their greatest attention and efforts on their primary offering — ongoing administrative support — while also creating one-time stand-alone services and DIY info products for those clients you can’t work with directly or who can’t yet afford your premium one-on-one ongoing support. Sometimes the client isn’t a fit for you. Sometimes you’re not a fit for the client. Regardless of the outcome, every consultation is an opportunity for learning and growth… even if you don’t end up working with a client, you can still make a new friend. Remember that it’s not all about the end goal. Investing in relationships, rather than outcomes, will always lead you down the path of happiness and success. So that’s the first kind of client. These are the people who are simply out to take advantage, of anyone and anything. These aren’t people you can have any relationship with because they don’t value other people, much less you or the work. They don’t get it and no amount of education will ever get through to them. They aren’t out to be educated; they’re out for Numero Uno. They’re out to get what they want while giving nothing or as little as possible in return. They don’t care who ends up with the short end of the stick as long as it’s someone else. For them, it’s always about them “winning,” benefiting, getting one over at someone else’s expense, not partnership and collaboration and mutually beneficial business. These are not the people who are deserving of any of your extra time or kindness beyond your normal professionalism. You don’t have to do anything, if you don’t feel like it, to help them any further than that. With referrals like that, who needs hot pokers to the eye. Don’t be held hostage to this notion that literally everyone is a potential referral source so you’d better be exceedingly nice and overzealously kind to everyone if it kills you. This ultimately also makes you a dishonest, inauthentic phony. Discern the difference. There are some people it’s just not worth dealing with, and there is more to life than business. Live it on your own terms and stop apologizing and second-guessing yourself. No one can tell you precisely how to spot a shark. I would tell you to not preoccupy one second of your time trying to spot them. It’s the completely wrong focus. Always be unfailingly professional and polite. There’s no reason not to be. Beyond that, however, you have no obligation to extend them any further help or kindness, nor play any part of foisting them upon some other poor, unsuspecting colleague. You don’t have to wish them any ill will or anything like that. But you do have the option of simply thanking them for their time, walking away, and doing nothing more, giving nothing more, if that is what you see fit to do. There are, and will always be, a million other more ideal, deserving, giving clients out there to more productively focus your time, energy and kindnesses on. When you focus on the bad eggs, you deprive the good ones of your gifts. 2 Comments Posted in Bad Clients, Clients, Getting Clients, Ideal Clients, Personal Musings, Professional Self Esteem, Rants, Referral Based Marketing, Working with Clients. Bookmark the permalink.